The computer-generated voice sounded much more natural than the virtual helper had done in the past and included “ums” and other sounds typically produced in human speech. “You cannot underestimate the value consumers will see in these voice assistants. Google also announced a new version of its News tool. A Full Coverage feature will let users delve deeper into stories of their choice, providing headlines from different “trusted” sources, Q&As, social media posts and relevant timelines among other information. Unlike many of firm’s services, the content will not be personalised. “Having a productive conversation or debate requires everyone to have access to the same information,” Google said in blog that provides more detail. The tech giant also showed off new features being added to its Maps software. These included the addition of augmented reality graphics that overlay information onto camera views of the path ahead in order to provide easier-to-understand directions than before. Cartoon characters are also being introduced to guide users which way to walk, while tapping on restaurants and other select venues will now provide scores indicating how much a person is likely to enjoy a visit based on Google’s analysis of their past behaviour. Google’s augmented reality chief Aparna Chennapragada also described work that had been done to improve the software’s ability to know where phone owners are located. “GPS alone doesn’t cut it,” she explained. The firm dedicated a section of its opening presentation to what it referred to as Digital Wellbeing technologies. These included the ability to schedule screen breaks on YouTube to encourage young users to avoid spending too long on the app at a time. Parents also gain the ability to schedule when internet connectivity should be paused to some or all of the devices being used in a home. And Android is to gain a new app dashboard that provides details about how much time users have spent using different services over the course of a day. “We are delighted that Google has heard the call from stressed-out parents to create ways to limit and control their kids tech use and to find a better balance in their own digital lives,” Stephen Balkam, chief executive of the Family Online Safety Institute, told the BBC. We’ve reached a tipping point in our use of computers, a time when the number of apps trying to get our attention with notifications and updates is making us many of us feel overwhelmed. That wasn’t a mistake – many apps were aggressively designed to attract and lock in our attention. But maybe not for much longer. 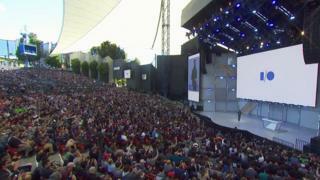 Much of Google’s focus at IO this year is about what it dubbed Jomo – the “joy of missing out”. Any move to reduce screen-time – particularly of youngsters – seems a good idea. But you have to question whether the same companies that got us into this mess can save us from it. Google’s business is still about attention – and the company knows full well that the addictive nature of YouTube won’t be affected by a prompt saying “take a break”. That said, therapists often say that acknowledgment is the first stage of recovery, and Google’s moves in the area could be appreciated by many. Android continues to dominate the handset market. Google’s operating system powered 85.9% of all smartphones sold last year, according to research firm Gartner, marking a 1.1% gain on 2016. Furthermore, it accounted for four out of every five mobile app downloads, according to analytics firm App Annie. Google’s own Play Store drove two out of every five smartphone and tablet app installations. Apple will host its own developers conference on 4 June.